Heavy rain has been forecast for the next few days for the Central North Island which should add a bit ofÂ fresh life to our Taupo and surrounding rivers. Rain started at about midnight last night and was very heavy for quite some time and I would assume this would have had some effect on our rivers this morning. I’m not all that sure that it will drag any fresh run rainbows up the river but with fish generally pushing into the rivers when they want to know and not just in the winter we might be lucky enough to get the odd one trickle through. This weather and rain will most definitely have a positive effect on the running of Brown trout and I will be expecting more to push up in the next few days offering anglers some of the best sport summer fishing can offer. I had a full day rafting yesterday on the upper section of the Tongariro and was a little dissapointed with fish numbers as it seems the majority of trout are either in the mid section of the river or have returned to the lake after spawning. This time last year there were more fish up higher and we were still having quite good numbers on most days with some dry fly adding to the memories of a great raft trip but yesterday was generally very hard for us. Majority of trout we made contact with or spotted while rafting through the pools were towards the end of the float which is near good public access which you all will be happy to know. 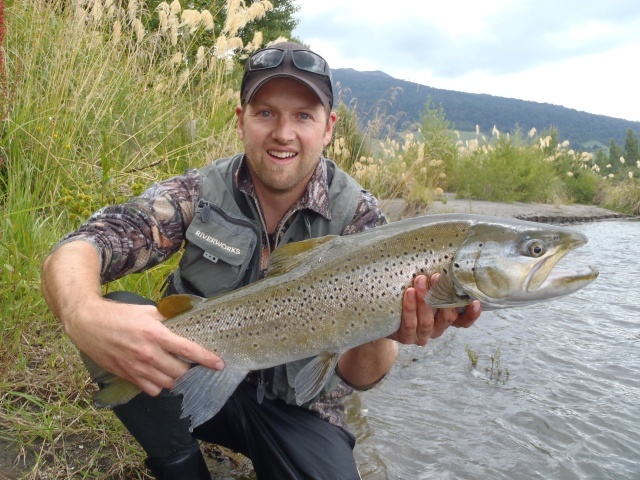 As you can see from some of these photos another good day was had spotting and casting at lovely browns in the Tongariro. Some of these fish are just beautiful creatures and are such a pleasure to see laying up in most of the deeper pools at the moment well within reach of anglers. I have been very lucky with these fish being in feeding moods and have never been involved in the capture of so many in a such a short period, but this is typical of the summer fishing that can be had on Taupo rivers. These browns are not easy to catch but with the right approach, fly and cast they will take your fly just the same as any other fish which is in the river. I have not seen any really big fish over the past few days but I feel sure there are some huge trout that are sitting deep in pools like Admirals or Shag pool. The trout that mike was able to get onto were all around the 5-7 pound mark with the best being a very pretty jack which weighed just over 7 pounds. I still find it hard to believe why some anglers think browns don’t fight and come in like a wet sack as these fish always jump, pull line and have you running up and down the bank from the minute they are hooked. I must admit we have been fairly sporting while using a #5weight rod which gives them plenty of opportunity to stay deep or in the current of the river. 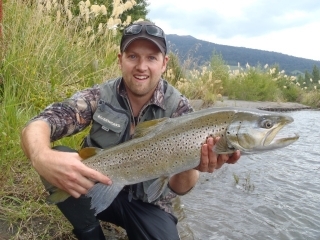 Taupo browns fight and look very different to fish from backcountry rivers such as the Mohaka, Waipunga or Whanganuie andÂ I must admit at times they can disappoint the angler when hooked. I have not had many reports from other areas in Taupo but I would imagine that the steady flow of browns into the Waitahanui has continued and anglers will be able to polaroid quite a few fish from the road bridge up. Again at times some of these fish seem dead in the water but occasionally you will get it right and he will surprise you by opening his mouth and swallowing your nymph. I saw a small number of good rainbows in here the other day that seemed to be a little more active and should be able to be caught while nymphing natural patterns. The Hine is another river worth looking at if fishing light equipment in shallow water is for you. ThereÂ is always the odd fish holding in the faster water which will take a dry such as a blow fly, para adams or cicada pattern. I usually have a nymph hanging of the bottom if I cant see lots of surface activity and this will quite often get taken by trout holding on the bottom and not looking to the surface. Some of the casting can be challenging in here with some of the best runs having overhanging trees and blackberry which just chew through fluro leaders and ruffle up your flies. Still this aside the fishing can be rewarding and a great summers evening can be had while strolling up the river with a light weight rod. Be safe on the water guys and hope to see you out doing it soon.